When you take a waterfront vacation, do you say you are going to the beach or going to the coast? Both the beach and the coast are places where the land meets the sea, but the names reflect the variety of features and conditions that may exist there. Sandy beaches, rocky cliffs, tidal flats, or barrier islands may develop depending on the coastal geology and topography , the size of the waves, the range of the tides, and the climate. The coastal zone represents a small area compared to the whole world ocean, but it is a dynamic setting, and it is where the most people come in contact with ocean processes. The often rapid natural changes that occur on the coast have an immediate effect on human-made structures and recreation. Sandy beaches exist along much of the East and Gulf Coasts of the United States. Sandy beaches develop where the tidal range is not too great (less than about 2 meters or 6.5 feet), and waves from the open ocean strike the shore. A rugged, rocky coastline like that found in Maine or along parts of the West Coast of the United States may have no beach at all. Erosion of the cliffs may produce smaller beaches in coves, sometimes consisting of gravel and cobbles instead of sand. The dominant process in these areas is erosion of the existing coastline by wave action. Plants and animals living along rocky coastlines must be adapted to deal with the high turbulence by clinging tightly to the rocks or hiding under them. Most beaches in North America are composed of quartz sand along with a few other minor mineral grains. However, in the southernmost areas where the climate is warmer, calcium carbonate (CaCO 3 ) sands form. These sands are commonly much whiter and comprise the beaches of parts of Florida and the Bahamas. Calcium carbonate sands are made of shell and coral fragments as well as ooids precipitated directly from sea water. Warm, tropical seas are supersaturated with dissolved calcium carbonate; therefore, the mineral precipitates much more readily than in northern climates. Shorelines with calcium carbonate sediments are still affected by waves and currents and can also be molded into beaches, barrier islands, and tidal flats. Many ancient limestones originated in this type of setting. 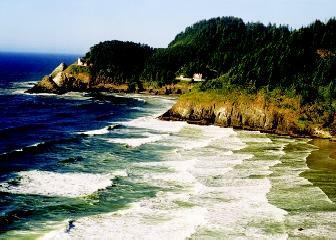 Rocky shorelines like this one in Oregon are dominated by wave erosion and may have few sandy beaches. Here the headlands are composed of resistant basalt. Beaches surrounding volcanic islands such as Hawaii may have black and green sands. 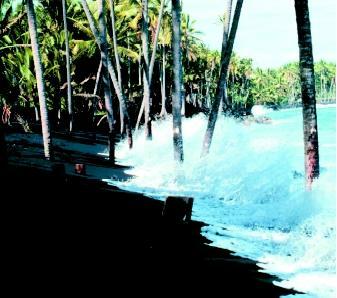 Black sands are produced by the action of surf pounding black basaltic lava flows into sand-sized fragments. Less common are green sands composed of the mineral olivine. Olivine is an iron-rich mineral common in basalts. It is an unstable mineral at surface weathering conditions, and can only accumulate as sand when an abundant source of basalt is present. A typical beach can be separated into three zones: the supratidal, intertidal, and subtidal. The supratidal zone is normally above the level of the ocean except during large storms such as hurricanes. Dry sand blown from lower on the beach accumulates in dunes paralleling the shore and may be stabilized by dune vegetation. The intertidal zone is a sloping, nearly planar surface between the high and low tide marks. This is the swash zone where waves break onto the beach. The size of the inter-tidal zone depends on the tidal range; the greater the tidal range, the larger the intertidal zone. Because of the constant wave action in the intertidal zone, few animals can live on the surface. Burrowers such as bivalves and crabs live in protected tunnels in the sand. The subtidal part of the beach is the shallow area just offshore that is never exposed by tides. It typically has a series of submarine sandbars that parallel the shoreline. The sandbars tend to move offshore in the winter when there are more storms and onshore in the calmer summers. The subtidal beach is strongly affected by waves as well as longshore drift. A black lava sand beach in Hawaii contrasts with a white calcium carbonate sand beach, such as found in Florida and the Bahamas. Beach materials can derive from erosion of rocks and coral reefs by ocean waves, from delivery of sediments by rivers intersecting the coastline, and from other processes. the flow of sand is interrupted. Dredging and pumping of sand often are required to artificially restore beaches. In some areas such as the Carolinas and Texas, the beaches are separated from the land by lagoons. These lagoons are shallow bodies of water that are protected from open-ocean waves by a barrier island. 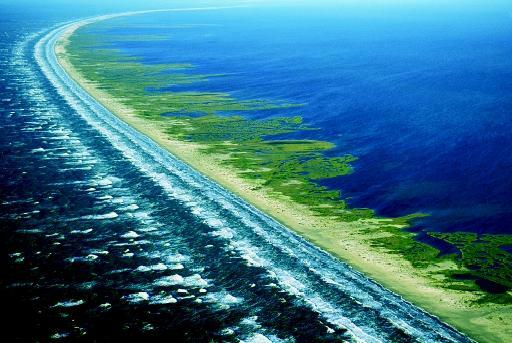 A barrier island may be only a few hundred meters wide, but dissipates the wave energy, so that the lagoons generally have small waves and accumulate finer sediments such as silt. Otherwise, the seaward side of a barrier island is the same as a normal beach. Human-made structures on barrier islands, as well as the islands themselves, are very susceptible to the forces of hurricanes. Because the lagoons are affected by tides, the water must flow in and out from the ocean through tidal inlets that cut the barrier island. The number of inlets is related to the tidal range and how much water moves through them daily. The greatest tidal range on the planet is the Bay of Fundy in eastern Canada, where the tides rise and drop 15 meters (nearly 50 feet) every day. Areas where the tidal range is more than 4 meters (13 feet) are called macrotidal. Along a macrotidal shoreline such as near Anchorage, Alaska, the intertidal zone is so wide that a tidal flat forms instead of a beach. The ebb and flow of the tides generate tidal currents that move sediment across the tidal flats in tidal creeks. The creeks have tributaries and look much like a river system, except that water flows in both directions. Even a small barrier island helps dissipate wave energy before it reaches the shore. This narrow arc of land may be a temporary feature, because it can easily be eroded or inundated. The tidal range varies from one region to another, but it also varies at the same point during the month. Because the tides are due to the gravitational pull of the Moon, and to a lesser extent the Sun, the Sun and Moon will align with the Earth and act together to produce spring tides, or will counteract each other at right angles to generate neap tides. Spring tides have a greater range (higher high tides and lower low tides) and occur when the Moon is in the full and new phases. Neap tides have a lesser range and occur at the first and third quarter phases of the Moon. Many marine organisms such as turtles and horseshoe crabs acutely tune their time of breeding to the spring tides. SEE ALSO Algal Blooms in the Ocean ; Beaches ; Bivalves ; Climate and the Ocean ; Coastal Waters Management ; Corals and Coral Reefs ; Crustaceans ; Estuaries ; Human Health and the Ocean ; Oceanography, Geological ; Oil Spills: Impact on the Ocean ; Tides ; Waves ; Weather and the Ocean . Duxbury, Alyn C., Alison B. Duxbury, and Keith A. Sverdrup. An Introduction to the World's Oceans, 6th ed. Boston, MA: McGraw-Hill, 2000. Kaufman, Wallace, and Orrin H. Pilkey. The Beaches Are Moving: The Drowning of America's Shoreline. Durham, NC: Duke University Press, 1983. Scholle, Peter, and Darwin Spearing. Sandstone Depositional Environments. Tulsa, OK: American Association of Petroleum Geologists, 1982. Scholle, Peter, Don Bebout, and Clyde Moore. Carbonate Depositional Environments. Tulsa, OK: American Association of Petroleum Geologists, 1983. Could you give the information, due to the interrupted beach caused by the structure of the breakwater for access channel to the port.